St Paul's Cathedral, London. Presented 1908. 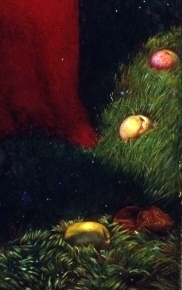 William Holman Hunt's painting of 1853 “The Light of The World” was one of the most popular images of Victorian times. Indeed it was so popular that the artist was obliged to paint a second version for Queen Victoria. A third (life-size) version of the painting (now in St Paul's cathedral and illustrated here) did a tour of America and the British Empire in a covered wagon, being seen by crowds wherever it went. It struck a cord with people everywhere and was considered a marvel of religious interpretation in paint. Behold! I stand at the door and knock: If anyone hear my voice and open the door, and will sup with him, and he with me. The picture attempts to put spiritual truth into visual form. It is filled with symbolism, not all of which is clear. In some ways this picture is so unlike most religious works. 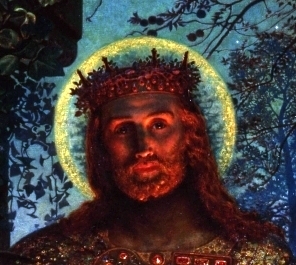 William Holman Hunt was a very devout Christian, but also very literal-minded. He found great difficulty in portraying this text, for Christ not only knocks at the door, He is the door. He not only holds the light; He is the light! JOHN 10:7 I tell you the truth, I am the gate for the sheep. 9 I am the gate; whoever enters through me will be saved. MATTHEW 5:16 In the same way, let your light shine before men, that they may see your good deeds and praise your Father in heaven. As we have heard Jesus state in John 12:46 (above) then let your light shine really means let Christ within you shine. Only in that way will others be led to praise the Father, as they will see only Him and not any of us. This use of light as a name/symbol for Himself; for our salvation and for the pathway to eternal life is a significant and important statement for Jesus to make. Light is the ultimate positive; often seen as perfection, with any adulteration being a move towards darkness; towards evil; towards our own ideas. The actor and comedian, Peter Sellers, recalled that after his near fatal heart attack in the 1960's – when he was technically dead for some minutes – he seemed to be moving closer to a strange yet familiar light. Others near death and surviving have reported similar experiences. "In England you know spiritual figures are painted as if in vapour. I had a further reason for making the figure more solid than I should have otherwise done in the fact that it is the Christ that is alive for ever more. He was to be firmly and substantially there waiting for the stirring of the sleeping soul." “Christ is to be seen only by the light of the star of distant dawn behind, and of some moonlight in front with most of all the light 'to guide us in dark places' coming from the lantern. This mixture of lights is all natural on the understanding that it is treated typically"
“The closed door was the obstinately shut mind, the weeds the cumber of daily neglect, the accumulated hindrances of sloth; the orchard the garden of delectable fruit for the dainty feast of the soul. The music of the still small voice was the summons to the sluggard to awaken and become a zealous labourer under the Divine Master; the bat flitting about only in darkness was a natural symbol of ignorance; the kingly and priestly dress of Christ, the sign of His reign over the body and the soul, to them who could give their allegiance to Him and acknowledge God's overrule. In making it a night scene, lit mainly by the lantern carried by Christ, I had followed metaphorical explanation in the Psalms, "Thy word is a lamp unto my feet, and a light unto my path,' with also the accordant allusions by St. Paul to the sleeping soul, "The night is far spent, the day is at hand." PROVERBS 4:18-19 The path of the righteous is like the first gleam of dawn; shining ever brighter till the full light of day, but the way of the wicked is like deep darkness, they do not know what makes them stumble. 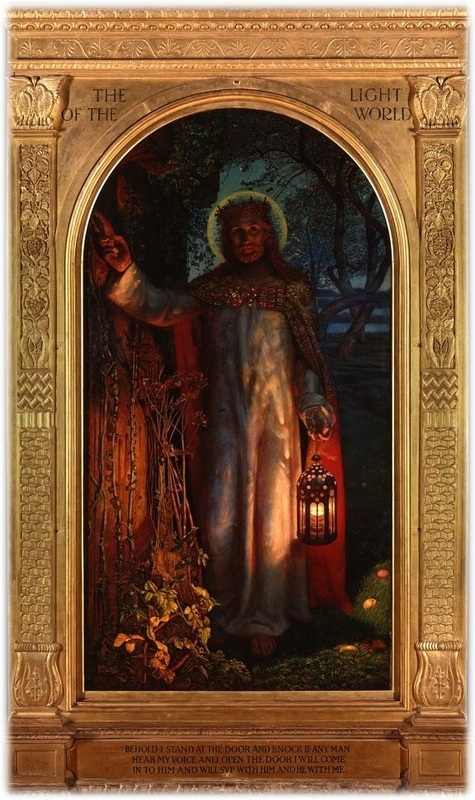 Holman Hunt was searching for a new way to portray spiritual ideas and he tried to do that while following Pre-Raphaelite principles, which hearkened back to a time (before Raphael) which was seen as more open, honest, workmanlike. It seems a contradiction in terms to pursue something new by following old ways. The most prominent of the old ways was the reliance on using symbolic images to put across the message, or to sermonise. Holman Hunt though, wished to find a way of opening up imagery of religious realism, and this painting was a major turning point in that quest. A lot of what I have detailed below is from other commentators; but some interpretation is my own; and as my principal purpose in writing on paintings is to aid an understanding of scripture – for myself, if for no one else – I have amplified the thoughts with Bible quotations. GENESIS 1:16 And God made two great lights; the greater light to rule the day, and the lesser light to rule the night: he made the stars also. The Hebrew word we interpret as star or stargazers has a number of meanings such as God's omniscience, of Messiah and many sons. This and the picture portrayed in this verse from Genesis gives rise to the stars as representing the sons of God; those who have been perfected in the resurrection light of Christ. The stars seem to be nine in number which suggests the fruits and gifts of the spirit (nine of each), as well as 'The Beatitudes', judgement, blessings and rest. All of these things relate to those elected to be sons of God. Also, angels (messengers of God) are interpreted as taking nine forms – the nine choirs of angels: seraphim, cherubim and thrones, dominions, virtues and powers, principalities, archangels and angels. If Holman Hunt intended any of these meanings it is entirely speculative, but having nine stars is certainly of significance in scriptural terms. The artist's statement that this mixture of lights is all natural on the understanding that it is treated typically, could in itself be interpreted as 'it means what it means', or 'as you see it'; leaving it up to the viewer to see in the light sources as one is led. Here are two crowns: earthly and heavenly. 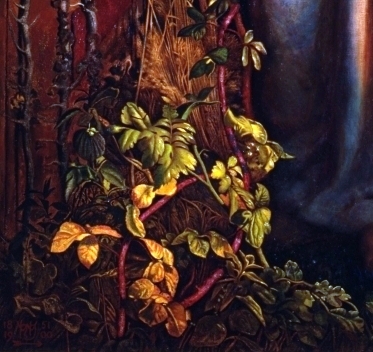 The earthly crown is the crown of thorns, although not the cruel fire-hardened spikes of Jesus' experience, but a stylised crown of what looks like hawthorn, with red berries to symbolise the blood. Christ's face is sad rather than pained and his gaze suggests a turning away from the door, together implying more than stating that the real suffering Christ endures is more the rejection by those He calls than by any physical pain. 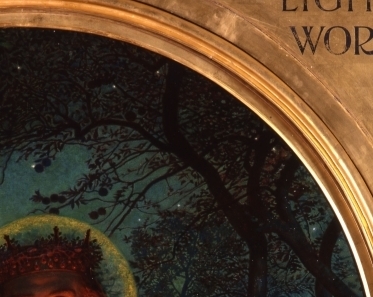 His heavenly crown uses the idea of a halo or nimbus – shown as a golden glow of light encircling the head (as opposed to the disc shape of earlier Christian art, or indeed of the earlier versions of this painting). The other name for a halo is the glory, and what more appropriate for this image of the glorified Christ. The bat has long been used as a symbol of blindness, and also – because they are to be found in old and empty buildings – of ruin and neglect. The fact that they are nocturnal creatures reinforces the idea that we are creatures of darkness unless the light of Christ is in us. ISAIAH 60:2 For, behold, the darkness shall cover the earth, and gross darkness the people: but the LORD shall arise upon thee, and his glory shall be seen upon thee. Ivy can be used as a symbol of fidelity and eternal life because it is forever green; and of attachment and undying affection because it clings to its support, but here the intention is plainly to show that the house has been untended. No gardener has cleared the doorway of vegetation and therefore speaks of a mind closed to Christ. The affection and attachment is for self, not The Lord and so is closed and inward-looking, instead of being open to the light of life. The door on which Christ knocks has no handle, latch or keyhole. It shows that Christ will not force His way into our lives; that his presence is ever with us, awaiting the appointed time. The door is the way to our innermost being and we must be open to him. But this overgrown and neglected door, as well as the darkness and the fallen fruit, indicate that the hour and the season is late. Christ knocks with a hand raised in blessing, but with a head turned from the door as if about to leave. The message is primarily evangelical, but there are still many other points of interest. The elaborate mantle that Christ wears emphasises His kingship, but also shows the High Priests jewelled breastplate with the twelve precious stones to denote the twelve tribes of Israel and His divine government. This was also known as the Breastplate of Judgement because there would also be the Urim and Thummim indicating innocence or guilt. EXODUS 28:30 And thou shalt put in the breastplate of judgment the Urim and the Thummim; and they shall be upon Aaron’s heart, when he goeth in before the LORD: and Aaron shall bear the judgment of the children of Israel upon his heart before the LORD continually. The High Priest's breastplate is here formed into part of a clasp linked by a cross to show Christianity and Judaism being brought together. 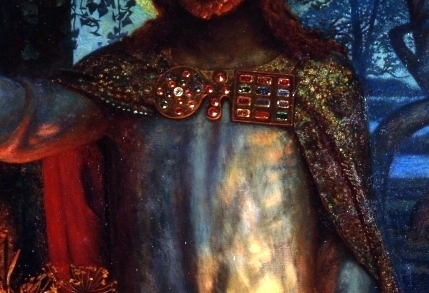 The story goes that the mantle was a representation of Holman Hunt's mother's finest tablecloth as a symbol that Christ is inviting the sinner to His table. JOHN 21:12 Jesus saith unto them, Come and dine. And none of the disciples durst ask him, Who art thou? knowing that it was the Lord. Hunt created his own system of symbols in his paintings, which he hoped would tell the story and "was not based upon ecclesiastical or archaic symbolism, but derived from obvious reflectiveness." These symbols "were of natural figures such as language had originally employed to express transcendental ideas". Thus he hoped the layman would readily understand and appreciate the message. But with Christ's robe we see a difference in its portrayal in the version we are looking at compared with Hunt's earlier versions. With each painting, he seems to refine the concept so that he produces no mere copy, but a restating of his premise. I believe this can be seen in the handling of the robe, the fold in which is casually placed to one side in the Keble College painting, but is centrally placed in the St. Paul's painting. 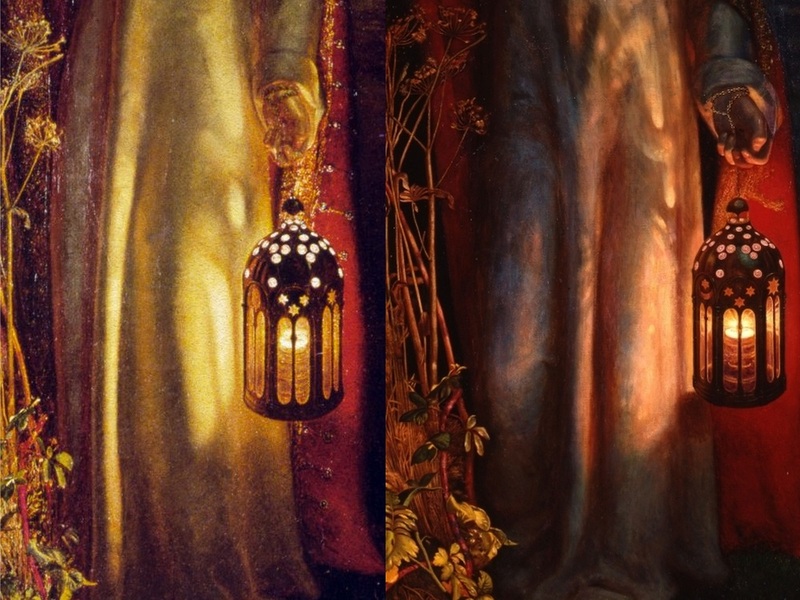 I have read no commentary on this, so it is entirely my own view, but the folds - and the way the light falls on the robe in the later painting - seem to resemble a palm tree; often seen in paintings associated with Jesus' triumphant entry into Jerusalem and as a symbol of His victory over sin and death. Scripturally, the palm tree was used as a symbol for the righteous man, coming from a word meaning to be erect, and the palm fronds a metaphorical hand (the hand of God?). The fallen fruit and the entangled tree trunks to the right of the painting are further evidence of the moral decay and neglect. PROVERBS 10:16 The labour of the righteous tendeth to life: the fruit of the wicked to sin. Fruit left lying on the ground has not been harvested and thus is bound to rot and be wasted. Likewise, a bent and contorted tree (as opposed to a straight and erect tree) is a picture of unrighteousness, or iniquity. It will not produce good fruit (in the spiritual sense). The fallen fruit rests on green grass representing life in the Spirit. This is the ground that Christ walks on, which brings hope. The message is clear; a warning to all to seek ye the LORD while he may be found, call ye upon him while he is near: ISAIAH 55:6. But the warning can also be seen as one to the Church, which Hunt believed was involved in pointless theological debates and ignoring its pastoral responsibilities, as was the main thrust of his painting The Hireling Shepherd.